The numbers show that Zimbabwe tourism is picking up. According to the Zimbabwe Tourism Authority,tourism receipts increased from $634m in 2010 to $664m last year. The big boost is from Chinese exhibitors, reflecting the marketing push to attract vistors from Asia. But will adding Robert Mugabe’s old residence to the tourist trail help? 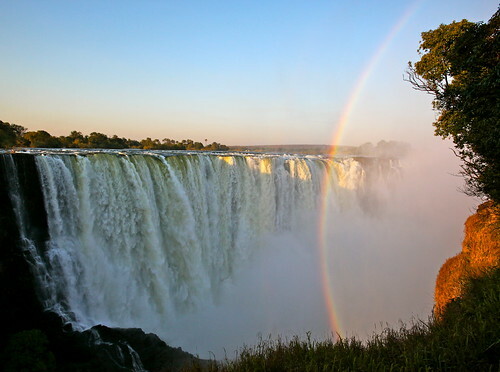 Victoria Falls is a top tourist attraction in Zimbabwe. Photo by Steve Jurvetson. Township tourism has worked in South Africa, where tourists are taken to Nelson Mandela’s Soweto house, and it is hoped it will do the same for Zimbabwe, despite the areas being dogged by poverty, water shortages and poor refuse collections. It remains to be seen if the concept will be shunned by tourists from western countries where, unlike Mandela, Mugabe is associated with tyranny, bloody political operations and violent land-grabs from white farmers.